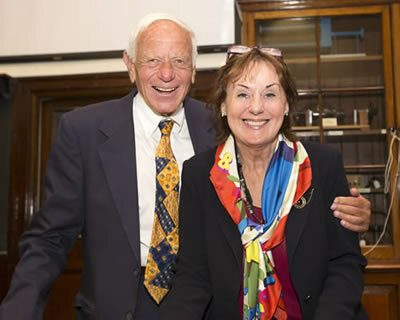 Professor Walter Bortz (pictured above with TILDA Principal Investigator Professor Rose Anne Kenny) gave a public lecture at Trinity College Dublin entitled "The Plasticity of Human Aging". The lecture took place in the historic Schroedinger Lecture Theatre in front of a capacity audience. A video of the lecture can be found here. Walter M. Bortz II, M.D., is a Clinical Associate Professor of Medicine at Stanford University School of Medicine and a graduate of Williams College and the University of Pennsylvania School of Medicine. Recognized as one of America’s most distinguished scientific experts on aging and longevity Dr. Walter Bortz's research has focused on the importance of physical exercise in the promotion of robust aging. Dr. Bortz has published over 130 medical articles and authored numerous books, including We Live Too Short and Die Too Long, Dare to Be 100, and Living Longer for Dummies, and Diabetes Danger. Dr. Bortz is past co-chairman of the American Medical Association’s Task Force on Aging, former President of The American Geriatric Society and is currently Chairman of the Medical Advisory Board for the Diabetes Research and Wellness Foundation, as well as a Senior Advisor to Healthy Silicon Valley, a community collaborative effort which addresses the soaring incidence of obesity and diabetes.